Editors’ Note: The lore surrounding women’s quilt retreats is rich with pranks, great sewing time, camaraderie and chocolate. But the “boys of batting” (our phrase, not theirs) have their own retreat tales to tell. 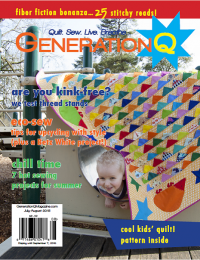 Quiltguy, a national online group for men who quilt, recently held one of its stitchy weekends, and were gracious enough to give us a peek into their organization–and their fun times. Thanks, guys! Women aren’t the only ones who form lasting friendships over cloth. 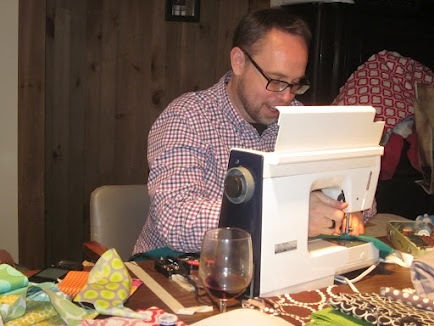 And a recent Quiltguy Quilt Camp in New Lebanon, New York—just one of many our group has held—is proof that we guys also know how to throw a cutting edge party. (Erk! Pardon the pun). First, though, let’s tell you a little about our group. The Quiltguy group was started by Kevin Britton in January 2000 with the aim of providing an online forum for men who enjoy quilting. 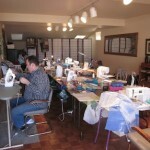 We needed a place to share information, exchange ideas, discuss projects, and enjoy the camaraderie of other guy quilters. 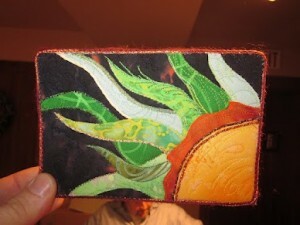 Our group is open to everyone, of course, but it’s geared towards the needs of male quilters. To date, QuiltGuy has 326 members in several countries, specifically the United States, Canada, England, Italy, Luxembourg and Poland. Since Quiltgu y started, we’ve held many events. We’ve had Christmas exchanges, block swaps, round robins and fabric exchanges. 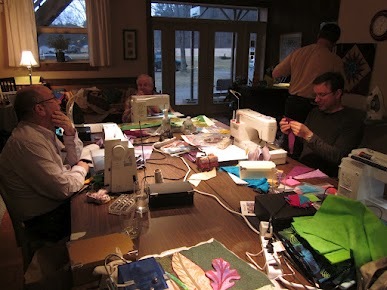 And several years ago, we began organizing all-male quilting retreats/camps. 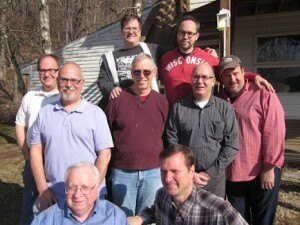 Now, a firm tradition has taken hold as we have two retreats per year in the Northeast. Our latest retreat was last month: the March 15-18 Quiltguy Quilt Camp in New Lebanon, where nine guys traveled from Massachusetts, New York, Vermont, Illinois, California, Pennsylvania and Ontario, Canada to share some primo stitching time. This was the second camp we’ve held in New Lebanon, and the seventh overall. Previous locations have included Woodstock, New York, and Teaneck, New Jersey. To date these camps have been attended by 22 different Quiltguys. Some have only attended once, but two Quiltguys have attended all seven camps. 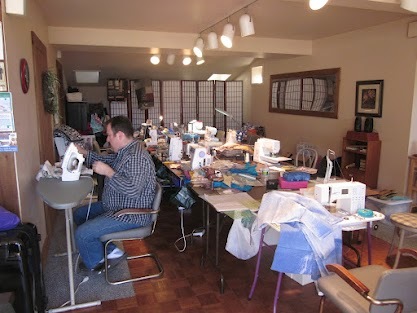 In total, 73 “sewing seats” have been filled since our very first camp took place on the second floor of the Woodstock Quilting Supply store back in August 2008. We’re very thankful for Bob Silverman and Jim Helm, co-owners of the Woodstock Quilting Supply Store, for getting the retreats started. We wish we could tell you all the projects that we worked on during our most recent Quilt Camp, but the list is too long and we forget some of them. We’ll just say that many quilt tops were sewn during the weekend and at least a few yards of thread were consumed in the making of quilt tops. Some of the quilts were simple, some more complex. 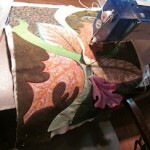 Some were an exercise in precision piecing, and some were an exercise in thread play. We still cannot believe that one person made a sun with green rays (probably a flashback to the Age of Aquarius). And in the end, it doesn’t matter what was worked on; they were all “Wow!” and we were happy to be there to see these projects come to life. Now, it wasn’t all project sewing. There was some rough stuff, too. We competed in a jelly roll quilt top race, and the competition was fierce with a lot of trash talking as guys intently sewed. Ron Bedard won the jelly roll race, wresting the title from Michael Lukens, who unfortunately was not there to defend his title from the previous camp. Another highlight of the weekend–besides all the quilting–was the Left-Right-Center Fat Quarter game, played using three appropriately marked dice. Andre Emmell won 45 FQs, and in the second match, Paul Léger took the kitty. This was Paul’s second win over two camps. 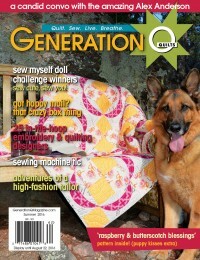 To date, he has won 115 FQs in this wilder side of Quilt Camp. With all-hours access to the workroom, some campers stayed up past midnight quilting and sewing and talking. 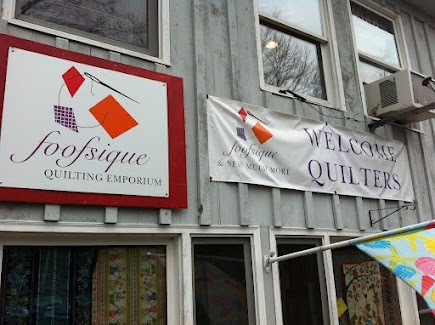 And some early birds started sewing as early as 5:30 a.m.
Guys attending the retreat also visited the nearby Foofsique Quilting Emporium shop during the weekend, and let’s just say that much was purchased. Male quilters don’t differ from female quilters at all when it comes to purchasing ample fabric for their stashes or current projects. 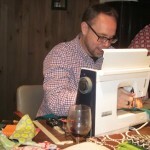 If you’d like to see photos of the QuiltGuy quilting retreats, we’ve got photos galore. Check out online photos albums of the retreats here, here and here. And if you know any male quilters who might like to join in the fun in September, they’d be most welcome! 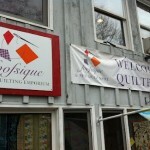 I loved reading this recap of a lovely quilting retreat. Thanks so much for sharing! 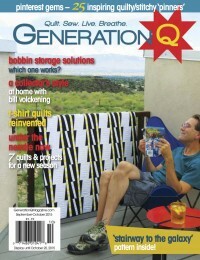 Sounds like the Quiltguys had F*U*N at their retreats!! If I’m remembering correctly, it’s a dice game, played with three dice–one marked “L,” “R” and “C.” There’s no skill or wagering involved…it’s purely a game of chance. (And sounds like a way to beef up your stash, if you’re lucky.) I’ve played it with quarters, but never FQs. You can probably find a LCR set at your local Target or wherever games are sold. Melissa, you’re exactly right. Instead of using quarters we use Fat Quarters. Everyone starts with 5 fat quarters and the winner gets a lot of fabric!! It was a great weekend we had lots of fun and not matter how much we write we will never get the great mood that was present that camp and all the other camps we’ve had. The Left-Right-Center is a dice game. There is 3 dices and each dice have the letter L, R, C or a black dot. You roll the dices, for every L you get you pass a FQ to the person on your left, For every R you get you pass a FQ to the right and for every C you get you put the FQ in the center of the table. The black dot means you keep the FQ for that dice. As mentioned there is 3 dices so if you get 3 L the you pass 3 FQs to the left, and so on. when you get down to one or two FQs then you roll onle one or two dices. you never know what is going to happen so you are in the game until the person with the last FQ wins all the FQs that are in the center of the table. We start with 5 FQs per player. We have a great time every time we play. I guess its no suprise I have never heard of this game but so glad you explained it and I will try and get a game going here in Barrie. 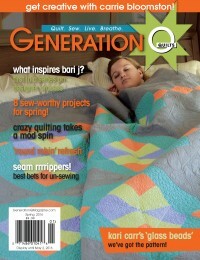 Congrats on the Quilt Retreat, amazing pictures and quilts you put us women to shame! My brother Ed was an avid quilter and especially liked the hand quilting, especially when he went totally blind but was still able to quilt, I think it was due to his passion for quilting that he was able to do this. Ed passed away 2 years ago almost to the day but he left a wonderful legacy to his family including me. 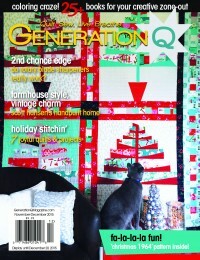 We entered 2 quilts in the Winnipeg Red River show and we won both times. One quilt was in blue and white with sailboats and the other was a red and white (old railroad design) I pieced them and he quilted them. Wonderful, wonderful memory for me. 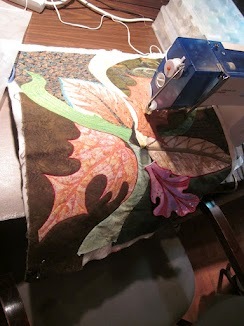 You may remember me from a quilting session at Joan Winter’s long ago. Paul I wish you and your enthusiastic quilting friends that all your 1/2 square triangles always square up and that your quilts always lie flat. 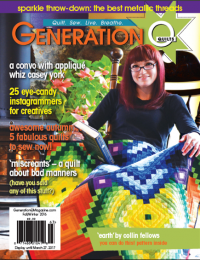 Go quilters go! Your amazing.